Online matrimonial website script helps to start match making website like shaadi or Bharatmatrimony. 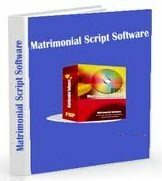 Matrimonial scripts are developed in ASP to create websites for planned marriages. Online matrimonial website script provides all features required for matrimonial website. The features include searching registered members, profile information, etc. Partner Search – Saved Search, Smart search, City search, Keyword search and professional search.